Reel Renovations Video Slot Review - Casino Answers! Reel Renovations is a 5-reel, 20-line video slot developed by Cryptologic, featuring a wild symbol, scatter wins and a bonus game. You can play the Reel Renovations video slot at [Americans: Unfortunately due to legal restrictions you are unable to play at any of the online casinos this game is at. We recommend you trying playing the unique slots at Win A Day Casino instead.]. Reel Renovations is a penny slot. Bets on the Reel Renovations slot machine are $0.01, $0.05, $0.10, $0.25, $1, $2 and $5 per line. You can select up to 20 paylines on the Reel Renovations online slot game. The maximum total bet is $100, which gives Reel Renovations a good betting range for most slots players. To play the Reel Renovations video slot, select your bet and hit “Spin.” You can also simply press “Bet Max” to play all 20 paylines on the Reel Renovations online slot machine. Reel Renovations’ top-paying symbol is the Paintbrush symbol. If you hit 5 Paintbrush symbols on an active payline, you will win the very generous 20,000 coin top jackpot on the Reel Renovations video slot. The Paintbrush symbol is wild and will substitute for all symbols excluding scatters. Other high paying symbols in Reel Renovations include the Roses (7500 coins) and Faucet (2000 coins) symbols. Win big with the Paintbrush in Reel Renovations at [Americans: Unfortunately due to legal restrictions you are unable to play at any of the online casinos this game is at. We recommend you trying playing the unique slots at Win A Day Casino instead.]! All wins are paid left to right and right to left. Payline wins are multiplied by the bet per line. Scatter wins are multiplied by the total bet and added to payline wins. Only the highest win is paid per selected payline. Wild symbols do not substitute for scatter symbols. Reel Renovations has a basic autospin mode. You can play up to 99 autospins at a time on the Reel Renovations online slot game. To start the autoplay spins, select your bet and hit the “Spin” or “Bet Max” buttons. To stop, press the “Stop” button next to the autospin counter. You can stop the autoplay feature at any time you wish. If you’re looking to make a few real renovations of your own, we recommend playing for that 20,000X top payout on the Reel Renovations video slot. You never know, maybe your dreams of getting your entire house re-done may come true. You can play the Reel Renovations video slot when you sign up and make a deposit today at [Americans: Unfortunately due to legal restrictions you are unable to play at any of the online casinos this game is at. We recommend you trying playing the unique slots at Win A Day Casino instead.]! 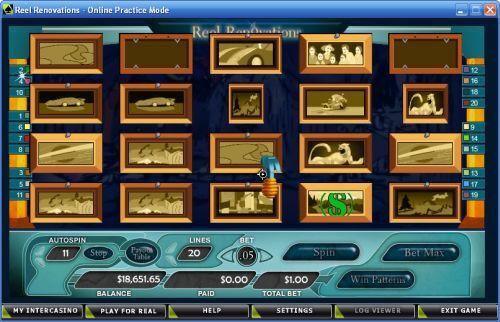 Can players from the USA play the Reel Renovations video slot for real money? No, American players cannot play the Reel Renovations video slot for real money at this time. For a real good handyman slot, we recommend that you read our Fixer Upper iSlot Review.